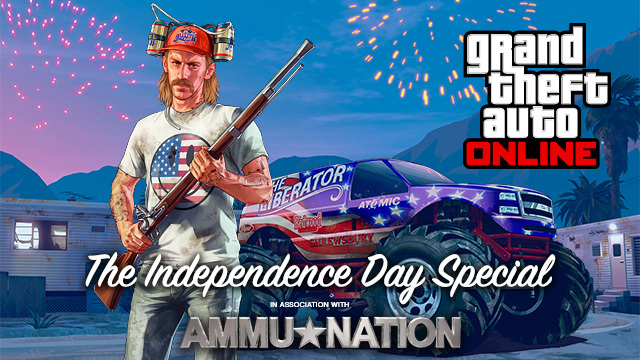 From Paleto Bay to the Port of Los Santos and everywhere in between, it�s time to celebrate the birthplace of freedom with�The Independence Day Special (in association with Ammu-Nation)�for�Grand Theft Auto Online. 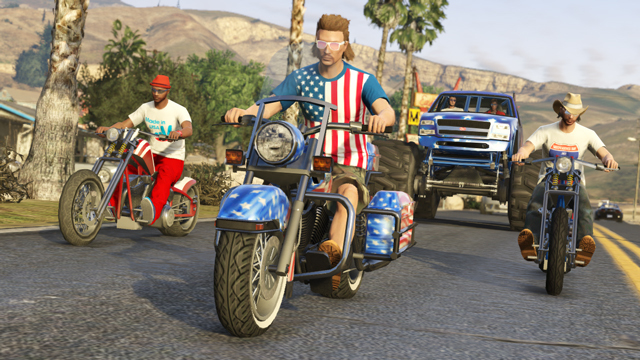 Demonstrate your exceptionalism and own the road from sea to shining sea with two new star spangled rides, the�Sovereign�motorcycle and the super-sized�Liberator�monster truck. And protect your rights the same way our Founding Fathers did with the latest addition to Ammu-Nation's antiques collection, the high-powered�Musket... or channel your inner Jack Howitzer with the spectacular�Firework Rocket Launcher. Seven new properties have also been added to the Dynasty 8 rolls, including locations in Paleto Bay and Vinewood Hills that provide plenty of yard space to scorch the grass with your very own Fireworks show. Use up to 12 varieties with different fuse lengths to create a spectacle that would make even the most battle-hardened Republican Space Ranger shed a tear. If you prefer rickety amusements operated by minimum wage teenage workers over incendiary lawn displays, then venture down to Pleasure Pier where you can now ride the Ferris Whale and the Leviathan Roller Coaster. This limited-time update also features an overabundance of patriotic flare: show off nationalistic pride with a "Made in the U.S.A." t-shirt, a backwoods mullet or let the eagle soar with an animal mask featuring this great nation's most fearsome and majestic creatures. 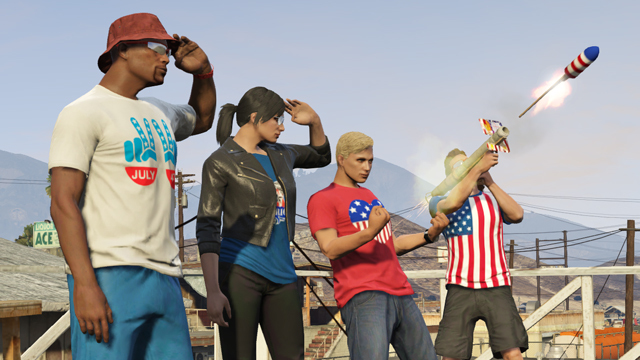 This special seasonal content will be available to redeem in-game until Mid-July (we will announce a specific redemption expiration date soon).�The automatic update for the Independence Day Special also includes additional game tuning updates and other adjustments, including the new�On Call Matchmaking�function. This new option allows players to accept a Job invite and continue playing in Freemode until that Job fills up, reducing time spent idle while waiting for Job to start. 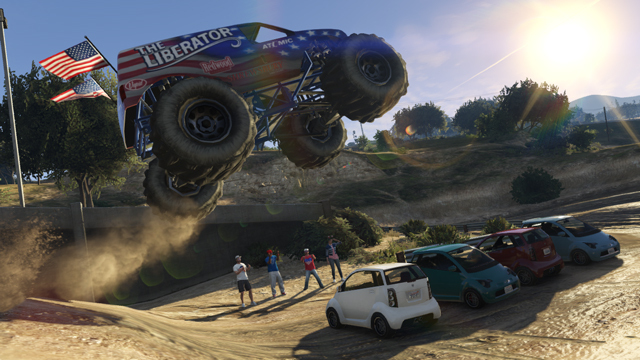 For the complete list of all the fixes and tuning updates,�visit the Rockstar Support site. 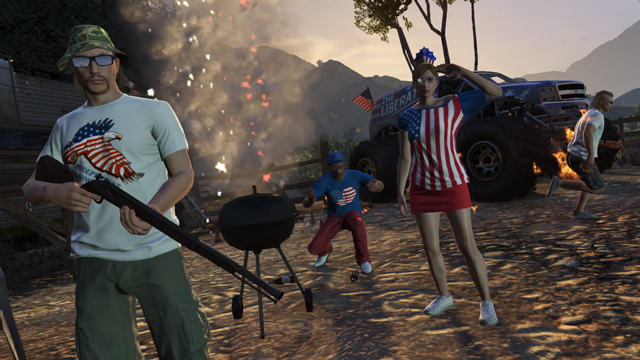 To download the Independence Day Special, fire up your online-connected PS3 or Xbox 360 and start GTAV. You'll be prompted to download the automatic update (1.15) and Xbox 360 players will also be required to download an additional compatibility pack upon entering GTA Online. And look for details about the upcoming celebratory 4-day Independence Day Weekend Event tomorrow.